If you’re wondering what to wear in San Francisco, you might not want to listen to The Beach Boys. If you do, you might get the impression the sun is constantly shining on the state of California. That’s pretty true for the most part but, unfortunately, it’s not always so in San Francisco. Here you can expect pretty cool temperatures all-year-round, which means you can leave those Havaianas in the hostel in favor of something a bit more practical. To help you get it right — and stop you looking like a dope in your newly bought cheezy San Francisco sweatshirt — check out this guide on what to wear in San Francisco. You may be wondering why the weather is different in San Francisco compared to the rest of California. The answer lies — in its most simplistic form — in the waters that surround the city. San Francisco sits at the top of a peninsula, which is the meeting point of San Francisco Bay and the Pacific. Here the hot winds from the land and the cold Pacific breeze clash, pulling in cooler air across the city and creating a vast roll of fog (more on that later). That means we don’t get The Beach Boys’ version of California or its Mediterranean climate in the peak of summer, but instead get consistently cool weather. Average temperatures run from 50°F (10°C) to 57°F (14°C), throughout the year, so you will need to pack appropriately. Unfortunately, if you are a backpacker in San Francisco, it’s not just a case of wrapping up warm — you need to be a bit savvier than that. That’s because, thanks to the varied nature of San Francisco’s terrain, microclimates appear throughout the city. It can be cool on one street and then much hotter two blocks later. It’s just a quirk of the city that you need to be prepared for. The most famous weather phenomenon in San Francisco is undoubtedly the epic fog that rolls over San Francisco during the summer months. The effect is created when hot and cold air collide, creating a low-lying cloud that flows from the Golden Gate passageway, along the north side and then into the city. While fog may not be every traveler’s idea of perfect weather, the effect in San Francisco is magical. 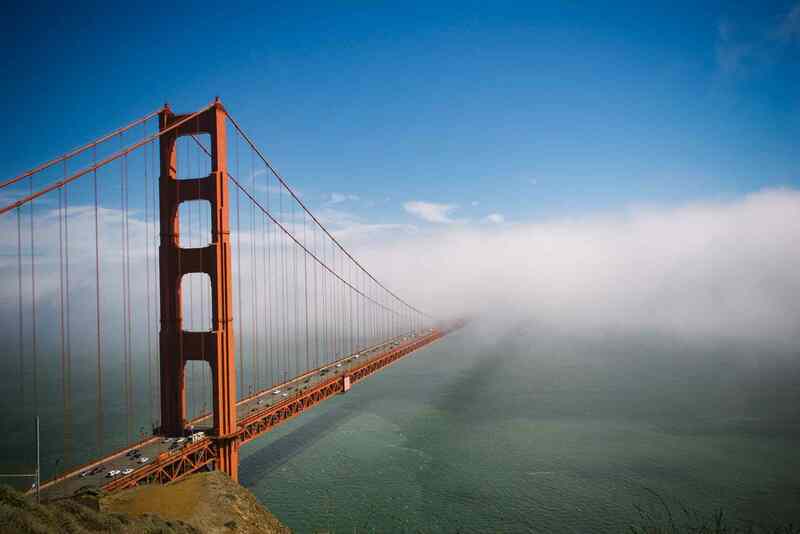 Backpackers and tourists to the city can get mystical views of the Golden Gate Bridge enveloped in fluffy, white fog. In fact, we say fog is the Golden Gate Bridge's natural habitat. For those on a budget, the sights are about as spectacular as they get in San Francisco, and viewing them costs absolutely nothing. “But why is it called Karl?” you ask. The name appears to come from Twitter account @KarltheFog, which was created in 2010 and now has more than 350k followers. The account holder reportedly took the name from a giant in Tim Burton’s movie Big Fish. Despite being a relatively recent development, the name stuck and now San Franciscans everywhere know the weather feature as Karl the Fog or simply Karl. Summertime in California sounds like it’s going to be a sunbather’s dream, but in San Francisco, you can pretty much put away those plans. There will be high temperatures in the low 70°F (around 21°C), but summer is Karl's favorite season because this is when he's most likely to dramatically cool the city. Furthermore, if you’re an adventurous backpacker you will probably be out and about for most of the day. While it can be pretty hot in the morning, as the day continues and the fog comes in, the temperature can fall. When you come to San Francisco during the summer you need to be prepared for all weather conditions. Layers are an absolute must. T-shirts are fine when the sun is out but consider bringing an extra shirt plus a lightweight jacket with you when you tour the city — especially if you are going to stay out at night. If you are particularly prone to the cold then include an extra item such as a cardigan or sweater. It might seem excessive but you will thank us when it gets chilly outside. Yes, with all these clothing options a day pack is a great idea. The good news is that rainfall is very low during the summer months, so you can leave the umbrella at the hostel. The weather in San Francisco during the fall months is usually when it's warmest. Average highs can hit high 80°F (around 27°C) because Karl the Fog is less likely to appear and bring the temperatures down. Layers are still essential but you can probably do without a thick sweatshirt. Instead, shirts or t-shirt is fine for when the sun is out. Pack a lightweight jacket and another shirt or cardigan for when it starts to get a bit cooler. Rainfall picks up slightly in September and then a fair bit in October. However, you don’t need to be too concerned about bringing waterproofs or an umbrella. Winter is, unsurprisingly, the coldest and wettest season in San Francisco. You can expect pretty cool temperatures throughout the day and night, plus a fair bit of rain. Even though it's cold, it's not freezing cold and Karl the Fog is actually less unlikely to be seen. Make sure you are prepared for all situations. We suggest taking a warm rain jacket with you everywhere plus a sweater and another layer. If you want to protect yourself from the wet, keep an easy-to-carry umbrella in your backpack. In a San Francisco winter, it’s always better to be cautious then return to your hostel with blue fingers and toes. Spring in San Francisco is pretty sunny, and Karl is generally still hibernating. It's mostly warmish, but not hot. Average temperatures of 65°F (18°C) will tell you that a t-shirt is okay, but once again, pack a warm sweatshirt or jacket for when it gets cooler. Again, being prepared is key. Pack more and suffer less. Now you should be pretty confident of what to wear in San Francisco. It’s all about layers, layers, layers. 1. A San Francisco tourist sweatshirt. Almost every major city in the world offers tourists the opportunity to buy a big baggy jumper with the name of the city on it. Obviously, it’s absolutely fine to buy one of these in San Francisco, but if you do, leave it in the hostel. Nothing screams “I’m a tourist because I didn't do my research by reading this blog post" more than walking around town with a newly minted tourist sweatshirt on. Wearing one of these just lets everyone know that you forgot to pack your layers and needed to get something on the fly. But, hey, if you want to promote San Francisco when you’re traveling around the rest of the world, we’re more than happy with that. 2. Heels. Okay, there will be times when heels will be appropriate. But if you’re a backpacker looking to explore the city then heels are not your friend. San Francisco can get super hilly, so sensible shoes are an absolute must. The world-famous Filbert Street, for example, hits 31.5% gradient at points, which means you’d be better off with climbing shoes over heels. Also, if you are on a budget like many backpackers in San Francisco, chances are you won’t be heading to anywhere too fancy anyway. 3. Shorts. Shorts are an absolutely classic mistake many tourists make. Yes, you are in California during the summer but, as mentioned before, that means nothing in San Francisco. When Karl the Fog whips around your naked ankles you’ll be cursing the day you decided to wear shorts. If you really must wear something on the shorter side, carry around a pair of jeans or trousers with you. Remember, temperatures can change pretty quickly so you’ll need to bring something you can slide in and out of easily. 4. A loose-fitting hat. When you look out your hostel window and see that it's sunny outside you would be forgiven for thinking that a nice loose-fitting hat might be the way to go. But forget about it. Thanks to its unique climate, San Francisco can get pretty windy. Your loose-fitting hat could well fly off your head never to be seen again. And we wouldn’t want that. If you do want to wear a hat, try a baseball cap which you can fasten securely to your head. 5. Anything too fancy. San Francisco is the city of the Summer of Love, it’s the birthplace of the hippie movement and the home of Silicon Valley. In other words, you don’t need to dress up too fancy. If you’re staying in a hostel then it’s unlikely you will have brought your best dinner jacket but even in San Francisco's fine dining establishments, the budget backpackers look is perfect. 1. Sunscreen. If you are a backpacker in San Francisco, then you’ll probably want to see many of the famous sights. 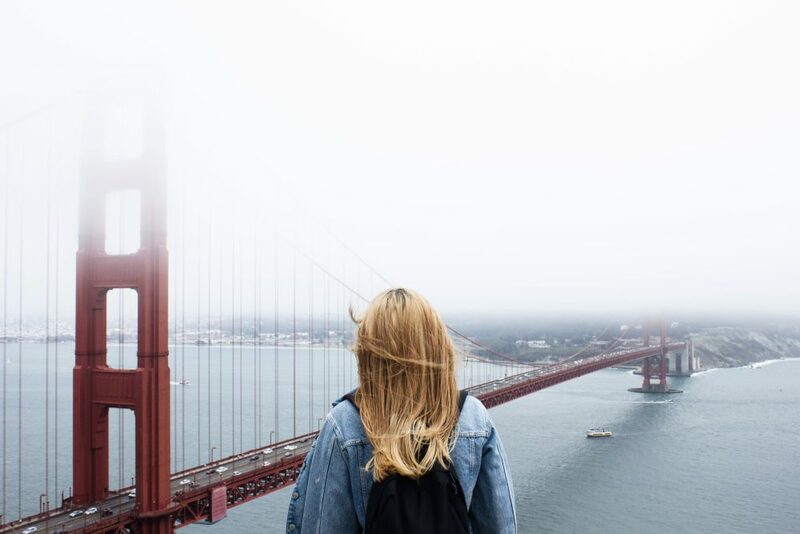 The Golden Gate Bridge and the Park, Alcatraz Island and much more are outdoors activities so you should protect yourself against the sun — even when Karl the Fog is in. Before you go out, ask us at reception since we usually have some behind the desk to share with you. 2. Camera. San Francisco is a photographer’s paradise. Make sure to bring a camera with you to capture all the stunning pieces of art, architecture and more that will undoubtedly catch your eye during your stay. 3. A comfortable daypack. As we’ve mentioned before, layers are an absolute must when it comes to dressing in San Francisco. Make sure you’ve got something to carry your clothes in when the sun is out. 4. Umbrella. Depending on the time of year, you may want to consider bringing an umbrella with you. The winter months, in particular, can get pretty rainy, so protect yourself by bringing along your brolly. We usually have a limited supply of free umbrellas in the hostel. There is a quote often misattributed to author Mark Twain that goes: “The coldest winter I ever spent was a summer in San Francisco”. While we’re pretty sure he never actually said it, the fact that it has become so widely spread shows there is some truth to it. Summer in San Francisco can be pretty cold. Karl the Fog and the competing oceanic and continental winds lead to fluctuations in temperature that are almost impossible to predict. Add on top of that all the microclimates and you’re pretty much just guessing what to wear in San Francisco. The only way to stop yourself from being caught out is to wear layers. You will need more during the winter than the summer, but layers are always your friend. Stay at Pacific Tradewinds Hostel and you'll get free luggage storage and a full laundry service — meaning you can pack as many layers as you can carry.